Can you break this Zodiac Killer copycat message? 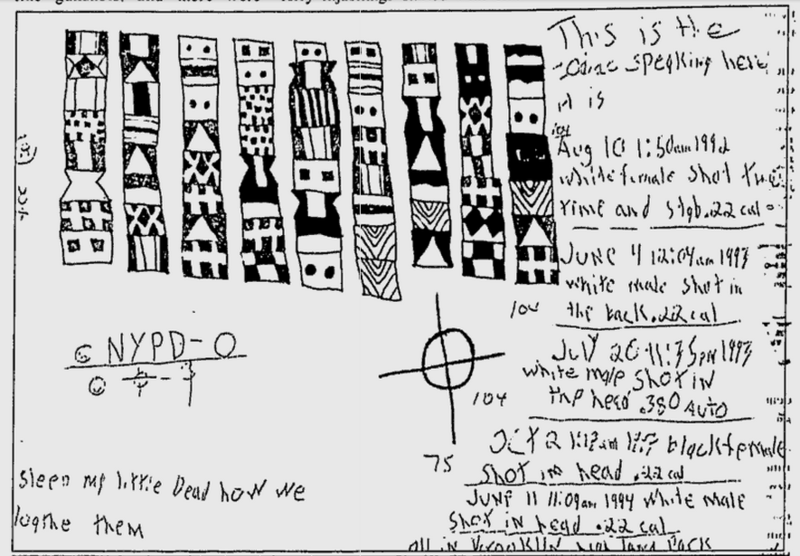 20 years after the last message of the infamous Zodiac Killer an unknown person sent a Zodiac-style postcard to a California newspaper. As far as I know, it has never been deciphered. After the TV documentary The Hunt for The Zodiac Killer has aroused new interest in the Zodiac Killer case, I it is now a good time to take a look at the Zodiac Killer copycats. In fact, there were at least ten people over the last four decades who sent Zodiac-style encrypted messages to the police or the media. Some of the anonymous senders claimed to be the real Zodiac Killer, others just imitated the killer’s way of encrypting. Some of the Zodiac copycat messages were solved, others weren’t. As far as I know, none of these letters could ever be linked to a real crime, let alone to the real Zodiac Killer. This message is a part of a letter that includes the words “Sleep my little dead how we loathe them”. It is introduced on a web site last updated in 2013. As far as I know, the “Sleep My Little Dead” message is solved. However, I don’t know the solution and I can’t find it online. Can a reader help? The three lines of cleartext contain the name and the location of the newspaper, as well as the expression CELEBRITY CYPHER. A “celebrity cypher” (today usually spelled “celebrity cipher”) usually refers to a crypto puzzle based on an encrypted quote by a famous person. Celebrity ciphers are quite popular among the members of the American Cryptogram Association (ACA) and other puzzle enthusiasts. There are books and web pages about celebrity ciphers. The woman on the stamp is poet (and celebrity) Marianne Moore – I have no idea if this is of any concern. 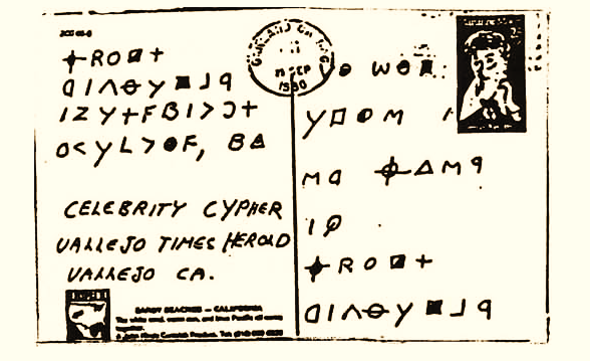 Of course, codebreakers have checked whether the letters used in the Celebrity Cypher message have the same meaning as in the first Zodiac cryptogram (this one is solved), but to no avail. This solutions, as well as a few others, I have checked don’t look very promising to me. Can a reader solve the Zodiac Celebrity Cypher? The Celebrity Cypher looks almost like a return US postal address. Makes sense, especially if lines 3/4 of the right half stand for MY NAME IS. As someone has certainly already noticed (I am new to this): the top two lines on the left, and the bottom two lines on the right are the same text. Probably sender’s name. – Guess out of the blue for the first four lines on the right: DO YOU / KNOW / MY NAME / IS / [first name] / [family name]. – The two letters on the left side, line four, after the comma, probably stand for a state or province (if sent from Canada?? – doesn’t look like it, though). Can’t make out the city in the postmark. – Am surprised this card made it through the mail at all, having no zip code. – A very happy X-mas to all! The card seems to be sent from California (stamp on lower left), so the two letters Thomas Ernst was referring to are probably CA. The round stamp could be from Oakland, CA. This would fit also the number of letters in the first word on line four. Also the Y=K (from the right side) would be a match. It seems like the vowels are rotated from one instance to another for the O’s on the right side? Perhaps < and > are A’s then? The city in the postmark and the fourth line on the left could be OAKLAND, CA (which is 40 km from Vallejo, CA). And the stamp seems to cover one more word starting with M – maybe ME. Merry Xmas! Oh, Narga was seconds faster. THIS IS THE ZODIAC SPEAKING. I AM IN CONTROL. THO’ MASTERS, BE READY FOR MORE. YOURS TRULY. “Truly” is erroneously enciphered as “truiy”, and the first letter of “tho” is not clear. Resembles the P in “speaking”. I found that in the “sleep my little dead” code, the author stayed very close to the “international code flags” alphabet. It seems the flags were only somehow doubled in some cases by “mirroring them to the right”. Therefore, I think it’s only a regular substitution (not homophonic) and there were simply a few errors made. I get PHOMASTERY instead of THOMASTERS. “Sleep my little dead how we loathe them” – is the distorted phrase of Edgar Allan Poe poetry. The origin one is: “Sleep, those little slices of death — how I loathe them”. Poe was very well known cryptologist – in 1839 he started his cryptocolumn in “Alexander’s Weekly Messenger” and in “Graham’s Magazine”. In May 1840 Poe offered the crypto-competition for anyone interested in ciphered texts and promissed to solve any cipher he receives. 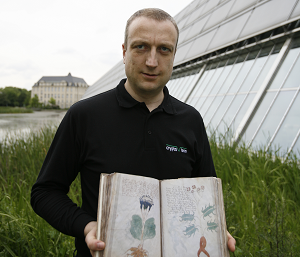 Finally he solved approx about 100 ciphered texts, but it is a fact that he recieved 2 messages signed by W.B. Tyler – which were solved in 2000’s only. 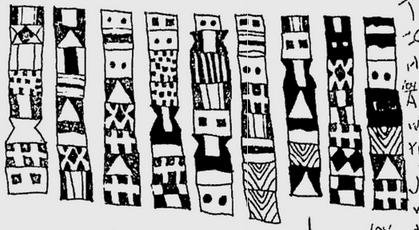 Mr. Tyler (some people beleives that Poe used that nickname) used a polialphabetic ciphering. 3) I’ve applied codes to another ciphered Zodiac letter of July 1969 – at list the last word of that message is “CHIPPING” or may be “CHIPPED”. those california newspapers must love it. a mad killer chooses to only communicate with a failing newspaper. boosting its ratings and sales. i wonder why the mad killer only communicates with a failing newspaper that needs increased publicity. this is sarcasm for you americans. 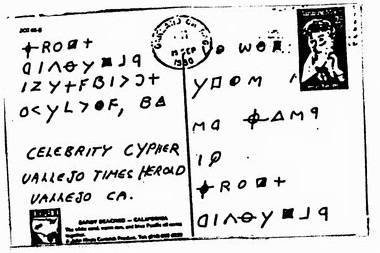 The alphabet of the Celebrity Cypher cryptogram looks pretty much the same as the one the real Zodiac Killer used because it was the real zodiac or at least it looks a lot like it to me the second one not so much but the top on which I believe is referred to as the celebrity cypher I believe could be the real deal. Right above the address at the bottom on the one side I believe is Oakland Ca on the other side three words down I believe it says my name is and then same as the top on the other side. I do believe the sleep now my dead cypher was also done by the new York copycat ? could be wrong but swear I read it was credited to him some how. The first one though to me looks a lot like the original zodiacs writing and style. Another thing I noticed in the second one is he starts it off by saying this is the zodiac speaking here. Originals he said this is the Zodiac speaking the here was not in there, What are those totem pole things supposed to be in the second cypher ? Used N for upward arrow symbol as i couldint find letters connected to the right and left Arrow symbols. This is also the same result as someone has gotten before I do believe in the actual care and message some of the letters stand for themselfs. Celebrity Cipher was solved long ago. Easy and makes sense, once you know it. The cipher was apparently intended as a poor taste joke. It was parodying the remark made by Paul Avery that the Zodiac was a “closet homosexual” and the Zodiac reacted by sending him an intimidating card. Seems to be something extra under the stamp (perhaps the full translation is something like “In his room I am too”, or possibly that stroke is just an errant mark.). The ciphertext delivers three distinct solutions, all which are used to describe the events behind a death of an entertainer and members of their families. This is the section targeting Ron Goldman, OJ Simpson, and his ex-wife, Nicole Simpson. This was a sort of Dirge repeating at the end, hinting at something hiding in the repetition of words. 3) The Shift – Using the Ciphertext stacked over the Plaintext, a shift of the Plaintext is made to the right to the 3rd letter. The words Celebrity Cypher and Herold in the address are aligned to show the count of the shifts, the repeating words to look for with the key to “Her Old Cipher”, using the Z340 Ciphertext. Take the results in the same way as the first solve is read and see that the new segment continues the Dirge to the chorus. The cipher that was used to set up the publicized illusions behind the Celebrity Cypher, and the attempts to ruin Courtney Love, Nirvana, and OJ Simpson’s careers with murders of their family members and associates. Tying them into the media drama that founded endless reenactments and documentaries, becoming the most sensationalized cases in the history of the country. This is the raw side by side comparison of the 3 ciphers. The Sleep My Little Letter was also used as part of the same era of media and Celebrity attacks, and was used to plant an agent in the CBS Studios as a Master Control Operator.